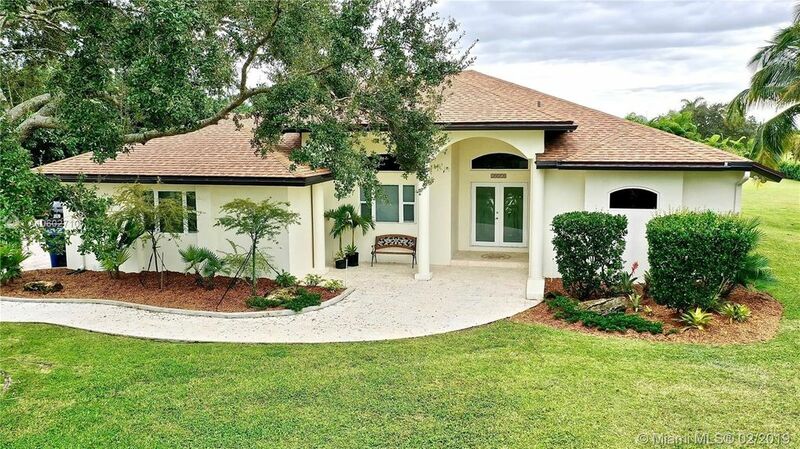 This 4 BR, 2 BA Redland home sits on 1.25 acres. Dble etched glass entry door. Living room has travertine tile & French doors to patio. Open kitchen w/white wood easy close cabinets, stone back splash, quartz countertop, island has gas cook top, pantry & SS appliances. Master BR has French doors to patio, rec lighting & his/her closets. M bath has dual sinks, jacuzzi tub, separate shower & rec lighting. Kitchen opens to family rm. Bedrooms 2 & 3 have walk-in closets. Laundry room has sink & door to the outside. 33x41 covered patio w/coral stones, summer kitchen w/burner, cooler, refrigerator & BBQ. Property has pump house & kennel. Fully fenced w/electric gate & 1 manual gate. Impact windows & doors. House was updated in 2015. See Seller's Disclosures for all updates/upgrades to property.